Welcome current participants. 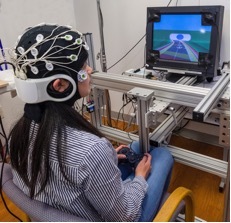 Here you will find instructions on Neuroscape research lab visits. If you are not yet a participant but are interested in joining, please visit Get Involved/ Participate. Electroencephalography, or EEG, is a commonly used non-invasive brain imaging technique. When neurons in the brain communicate with each other, they emit electrical signals. If many neurons in a certain region of the brain emit an electrical signal at the same time, that signal can be picked up by sensors, or electrodes, placed on top of your head. This brain activity naturally occurs all the time – for example, when you are trying to remember what to pick up at the grocery store or when you are closing your eyes to relax. The EEG device is a headset with up to 64 or 128 electrodes. The electrodes are used to record electrical activity from the brain. 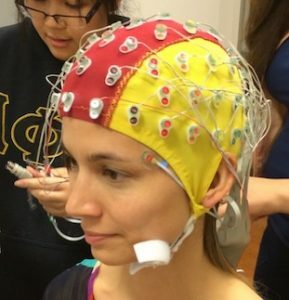 The electrodes are conveniently situated over different brain regions in the headset, or cap (resembling a swim cap), that researchers place on your head. 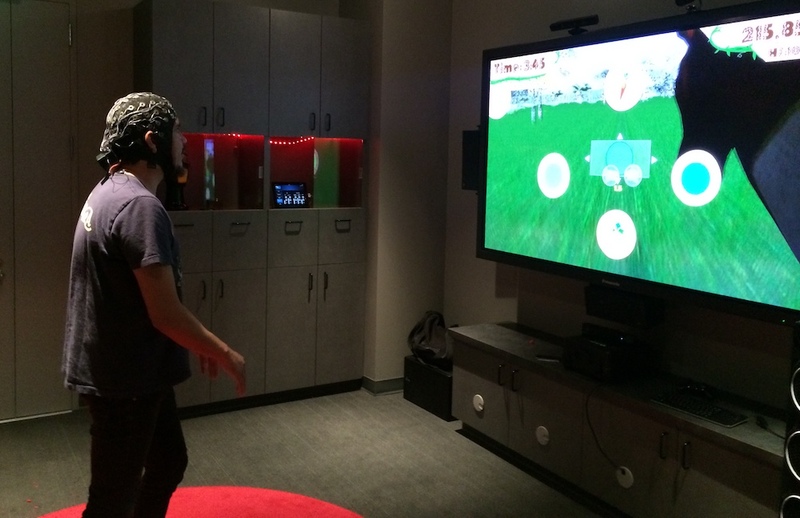 We also pick up and record movement, such as eye blinks, by placing additional electrodes on your face. Some caps require gel which is applied between the electrodes and your scalp. This helps researchers pick up a clear signal from your brain. It is important to remember that the electrodes only pick up and record signals emitted by your brain – electrical activity is not going into your brain. Preparing for an EEG session is quite simple. Please arrive with clean and dry hair without product, such as hairspray, gel or excessive conditioner. Thoroughly remove facial makeup before the session. Because the EEG records signals from your scalp, we ask that you remove any tightly woven hair, such braids or dreadlocks. You may bring snacks if you choose. We provide water. 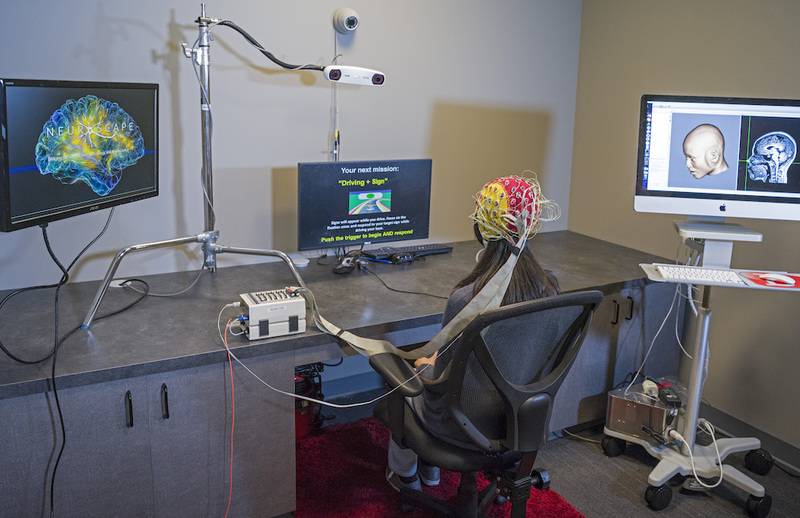 EEG has been used for decades in scientific research and medicine to image the brain. It is considered a safe and non-invasive procedure. A seldom-recorded side effect is a slight itching or burning sensation where the gel touches the skin. In order to minimize this, the researchers thoroughly remove any gel residue with cleansing alcohol pads after the EEG session. If you experience a slight itching or burning sensation after the session and it persists, please consult your primary care physician. 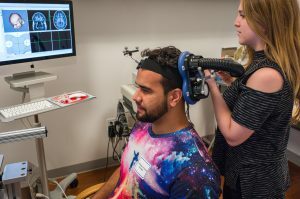 Researchers typically record EEG activity while you are completing a series of tasks on a computer or mobile device. An EEG cap will be fitted to your head and you will be asked to wear this cap for the duration of the session. You will not feel anything from the recording other than the sensation of the cap on your head and the gel when it is applied. These sessions can last a few hours; however, the researcher will provide breaks upon request. We provide shampoo, conditioner, a towel, and a hairdryer for you to use after the EEG session to thoroughly wash your hair of any remaining gel before leaving our lab. Transcranial alternating current stimulation (tACS) and transcranial direct current stimulation (tDCS) are two forms of non-invasive brain stimulation that modulates brain activity via weak electrical currents. The major focus on tACS/tDCS at Neuroscape is to assess whether these technologies may be used to enhance various cognitive functions. Although both technologies hold potential to enhance cognition, the main difference is that tDCS applies a constant electrical current, whereas tACS alternates current between stimulation electrodes in a frequency-specific manner. In either case, the current generated is approximately the same as that drawn by a hearing aid. Due to the weak currents used, the application of both tDCS and tACS have been found to be very low-risk. Although there is the possibility for mild discomfort during the stimulation such as tingling, itching, and skin redness in the area of stimulation, it is generally well tolerated. The tACS/tDCS device is a headset with 32 electrodes. Only a few electrodes are used for stimulation, while the others are used to record electrical activity from the brain (i.e., EEG) to help us understand the neuroplastic changes associated with these techniques. Unless otherwise specified, no special preparation is needed prior to tDCS/tACS studies, and you may follow your regular daily routine. However, just like EEG, tACS/tDCS does not necessarily work well with tightly woven hair such as braids or dreadlocks. As such, you may need to unweave such hairstyles. The effects of transcranial electrical stimulation on fetuses have not been fully investigated. For this reason, pregnant or potentially pregnant women should not participate in these studies. A tACS/tDCS device (as pictured above) will be placed on your head and small dots of gel will be placed in your hair at each electrode site. The gel is water-based so it should wash out easily and will not change your hair color. Each study visit will last approximately 2.5 – 3.5 hours but the total time of stimulation will not be longer than 40 minutes in a single visit. You may stop the stimulation at any time. Transcranial magnetic stimulation (TMS) is a method applied at the scalp to briefly alter the normal processes of neurons on the outer surface of the brain that receive stimulation. Different frequencies and intensities of magnetic pulses are applied to cause either excitatory or inhibitory firing of neurons in a narrowly focused area of the brain. Because TMS directly causes only transient changes in the brain, it has been safely adopted for many therapeutic as well as experimental applications. In most cases, the TMS coil, which is the part of the apparatus that is pressed against the scalp, takes a figure eight shape like a large, rubber-coated pretzel. Cables attach the TMS coil to the electrical hardware and amplifiers that control the frequency and intensity of magnetic stimulation. Usually, the patient/participant sits comfortably in a chair while a technician holds the TMS coil by hand against the scalp. Sometimes the TMS coil is held in position by a fixed stand. Feeling comfortable and rested when the session begins is important. Be sure to have a full night’s rest before the date of treatment, as well as your normal meal pattern up until about 90 minutes before treatment. If you are ill, congested or noticeably fatigued on the day of treatment, delay your appointment until you are recovered to fully normal. Receiving TMS stimulation should not produce effects that linger more than a few minutes once treatment ends. You will be fully capable of operating equipment, driving or thinking as soon as you leave your treatment session. At the beginning of TMS sessions, we deliberately assess the minimum intensity required to cause effects at the targeted brain region. Using this approach, we can be completely confident that TMS treatment is entirely safe. Many, many thousands of clinical and experimental sessions using TMS procedures have been conducted without adverse outcomes over the past decade. We will screen your health history carefully to be sure you have no medical risks that preclude TMS treatment for you. Although there is theoretical risk that seizure may result from unusual neuronal stimulation, such adverse events have not been reported in association with TMS using our approach. When the treatment session is done, participants often feel mildly disoriented. Fully normal awareness returns within minutes, however, and we have had no reports at all of any lingering after effects or headaches. You should expect to leave a TMS session feeling just as well as when you arrived. The sensation from each TMS pulse is usually noticeable during treatment. Depending upon where on the scalp treatment is targeted, the sensation can feel like anything ranging from mild tapping to dull jabbing on the skull. At the most sensitive regions, the jabbing can feel like flicking your index finger against your head as hard as you can. Although participants often describe such jabbing as irritating and mildly uncomfortable, no one describes the sensation as painful. As soon as the pulses stop, the sensation stops. Our procedure includes hearing protection to screen out the loud clicking noise that can be bothersome during some TMS treatments.